Hillgrund's Tomb is a small Nordic barrow where the Hillgrund family dead are interred. The barrow is located south-southeast of Valtheim Towers and southwest of Windhelm. It has an exterior area and one interior zone: Hillgrund's Tomb. It is located in The Pale, although this makes no geographical sense (see notes). The path up to the barrow is at the west end of a bridge over a large tributary of the White River, near its confluence with the Darkwater River. Walking up the steps of the path, you'll pass under numerous stone arches before arriving at the tomb entrance, where Golldir fights an internal battle between fear and family honor. There is a fire pit in the center of the room with sideboards on either side of a locked iron door (key required), that leads into the barrow itself. The sideboards hold three salt piles, a bowl of bone meal, a potion of minor healing and four common books. In the eastern corner of the antechamber is a frostbite spider egg sac. A level-dependent locked chest can be found behind the tomb's entrance, up against the cliff that overlooks the barrow. Just a few feet east of the chest, on the ground, is a medium coin purse. Golldir will approach and ask for your help. Once you agree to help he will unlock the door to allow access inside. This will start the relevant quest. Hillgrund's Tomb is fairly straightforward, but there are some side rooms and things that can be missed. A light source such as Magelight or Candlelight is preferable for navigating the fairly dark area, unless of course you have a form of night vision. There are countless urns, burial urns and dead draugr that are ripe for looting. If Golldir is with you, he will object to you looting his family's tomb, but then sigh and ultimately agree to you helping yourself as long as you help put a stop to Vals Veran. The first room you enter has a central stone altar, two thrones against the side wall and a dead draugr on the floor by the open door out of this room. Beyond this doorway is a narrow flight of stairs leading down to a corridor that continues down several flights of stairs to the southeast. There is a draugr patrolling the stairs near the top with a second farther down. Opposite is a wooden door with an apprentice-leveled tension cable that triggers a swinging mace behind the door. 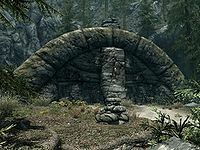 There are four sprigs of snowberries on the ground in front of the door and a small alcove containing a large urn, behind which are six small holes in the wall, three of which contain draugr, but only the top right-hand one with the feet showing can be looted. Descending the stairs to the southeast, you will pass a broken throne and upright sarcophagus on your left, down to a landing with a raised area on the left containing a sideboard with a random filled soul gem in a holder. There is a closed wooden door on the right with a few red apples and several bottles of alto wine and wine. Behind the door there is a small catacomb area, with a leveled draugr standing in an alcove with more bottles of wine among an oil slick on the floor. Around the corner is a mead barrel and three dead draugr in small holes in the wall, two of which can be looted. There is a third lootable draugr on your left as you enter. Descend a final flight of stairs to a lit area, with a turn to the southwest leading to an iron door and a novice-locked chest. Picking the lock will cause Golldir to complain as mentioned previously. Through the door is a room with two leveled draugr inside. You will also find the body of his aunt Agna in the middle of the room. There is a set of shelves to the east holding some ancient Nord arrows. To the south there is a barred door with stone tables on either side these holding a bowl with three bulbs of garlic, a portion of grilled leeks, a garlic braid, a baked potato, two salmon steaks, a seared slaughterfish, a bowl of bone meal and a potion of minor healing. To the west is a wooden door. Golldir mentions a secret route to the central chamber that avoids the barred door. The route is through an abandoned part of the barrow that contains disgraced ancestors. Before leaving this room, you can access a hidden alcove opposite the barred double doors by pulling a chain to the left of the movable stone. The stone will slide down to reveal an unlocked chest, a healing potion, and a light armor potion. The way forward is through this second door, beyond which is a far more decrepit and dangerous catacomb. There are the occasional fly amanita growing, and several of the alcoves contain draugr that can be looted. At the bottom of several small flights of stairs there is a caved-in section, a wooden door to the north, and two draugr that will rise and attack as soon as your presence is noted. Among the cave-in rubble there is an unlocked chest. Through the door to the north is another catacomb. In the second section there are two draugr slumbering upright in alcoves opposite each other. Attacking one will alert the second, unless you have a sufficiently high sneak skill. When you have dealt with these, Golldir will warn you of a pressure plate that triggers a poison dart trap. Around the corner to the north is a T-junction with three leveled draugr, two of which are slumbering in alcoves to the west, with the third roaming. The pressure plate Golldir mentioned is to the west, between you and the draugr. As soon as you engage the first draugr, the remaining two will join the battle. Once they are all dealt with, you can investigate the area. To the east are an adept-locked chest and more draugr to loot. The path to the west then turns south and continues forward to a wooden door. This brings you back out beyond the caved-in section. There is a slumbering draugr in front of you and a gap to the west. Beyond the gap there are cobwebs all around the room and an iron grating in the middle of the floor with water beneath it. A frostbite spider will drop from the ceiling as soon as you enter. To the east up a couple of steps is an upright sarcophagus hidden behind webbing that houses a skeleton with a random enchanted weapon beside it. There is a silver ore vein to the south, immediately to the right of the path onward. The only other item of note is a web sac that you can harvest a skeever tail from. Continue through the catacombs until you pass a symbol of a whale on your left. Shortly past here things can get quite hectic, as there are several high-level draugr that will join the attack as soon as any fighting starts. There is a brightly-lit area with a slumbering draugr in an alcove to the right of a large urn, a second around the corner in an upright sarcophagus, and several more in alcoves farther along the catacombs. Once you have dealt with all the draugr, Golldir will announce that it looks like the area his aunt told him about, and that "The bear will show the way". Looking around the area, you will find symbols on the walls similar to the ancient puzzles seen throughout Skyrim. The bear is on the corner of a wall to the south with a lit brazier beside it. There is a chain hanging down beside it. To the right of this, in an alcove, there is a selection of fungi including bleeding crown, white cap and fly amanita growing. Pulling the chain will punch out the cover to an upright sarcophagus to the east, revealing the way forward. Through the sarcophagus is a room with a sideboard holding a random potion of healing and several sarcophagi against the walls around the room. In the southwest corner there is a leveled draugr sitting on a throne. There is an empty set of shelves in the middle of the east wall, and to the right there is an arch through to another part of the room with an apprentice-locked wooden door to the south, behind which is an alcove containing a sideboard holding an unlocked chest, a random healing potion, a random magicka potion, and a leveled magicka potion. To the northeast are double iron doors which, Golldir comments, lead to the main chamber where Vals Veran is performing his necromancy. Beyond is a multi-leveled room with several flights of stone stairs, with Vals Veran on the highest level to the north. Unless you kill him with a single hit, he will teleport around the room while waves of draugr awaken and join the fight. Once the boss-leveled draugr rises, Vals Veran will stop teleporting. Once you've killed him, you will still have up to nine leveled draugr to face. At higher levels this can become quite challenging, with the draugr all able to use the Unrelenting Force shout. There is a master-locked iron door to the north from the highest level. It is unlocked by the key carried by both Golldir and Vals Veran. Beyond this is a small room with the barred door found near the beginning of the barrow opposite, and an expert-locked chest to your right that is opened using a key given to you by Golldir if he has survived. Opposite, to your left is a stone table holding a random helmet, an apothecary's satchel, a gold necklace, a garnet, an amethyst, a diamond, and five loose coins. Through the barred door, you are led back to the room where Agna's body was found. An adept-locked chest can be found 370 feet south of the entrance to the tomb, along with a leveled bow and a copy of the Illusion skill book The Black Arts On Trial. They are all next to a rotten tree stump with a dead bandit nearby. If you continue past the chest to the south, you will come to a large tree that has fallen and now spans a large gorge, with a bandit standing in the middle and more on the other side. They will attack if you try and cross, although given their precarious position, using an Unrelenting Force shout on them will knock them off into the river below and a swift death. Version 1.2.6 of the Unofficial Skyrim Patch modifies this location to be part of Eastmarch hold, instead of the Pale, as it is located far south of the Pale's southern border. This page was last modified on 16 April 2019, at 19:01.